The current generation of nuclear reactors (Gen II‐III) guarantees a stable supply of nuclear energy for the next 2‐3 decades but additional development of nuclear technology is needed to reduce further potential accident risks and above all to increase its sustainability. The development of next generation (Gen IV) reactors, especially fast reactors, will greatly increase sustainability and mitigate long term impact of nuclear waste, when combined with concomitant fuel recycling facilities, firmly establishing the circular economy via closed fuel cycles. Europe has defined as its priorities three fast reactor designs: the sodium fast reactor (SFR) as reference technology, the lead (and lead‐bismuth) fast reactor (LFR) and the gas fast reactor (GFR) as alternative technologies. In 2010, Europe, under the umbrella of the Sustainable Nuclear Energy Technology Platform (SNETP), launched the European Sustainable Nuclear Industrial Initiative (ESNII). The objective is to demonstrate Gen IV fast reactor technologies with closed fuel cycle, to harness European research and industrial capabilities to build advanced fast reactor prototypes and develop supporting infrastructure. Four prototypes or demonstrators are being designed: ASTRID for SFR, MYRRHA (ADS/LFR pilot plant) and ALFRED (demonstrator) for LFR and ALLEGRO for GFR. The operating conditions envisaged for these future systems are extremely demanding: high temperature, intense and prolonged irradiation, chemically aggressive environments. Therefore, the necessary nuclear materials will be exposed to very taxing conditions while simultaneously needing to respect increasingly high safety requirements. The performance of nuclear (structural and fuel) materials is therefore an essential aspect to make Gen IV reactors a reality. 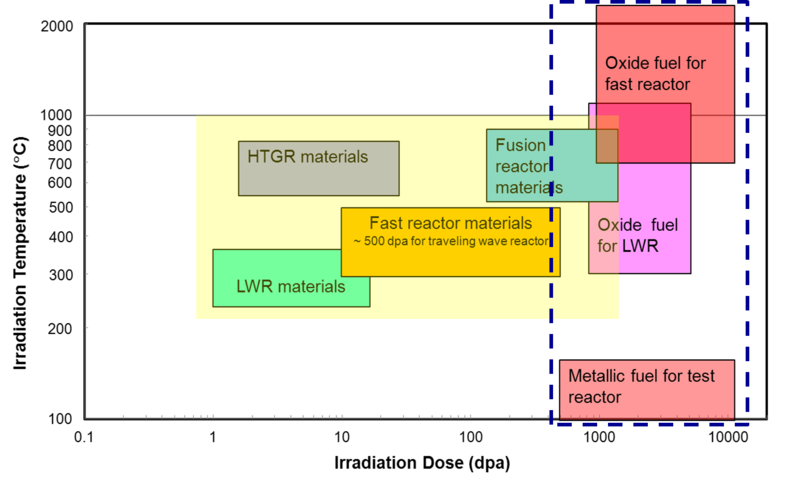 Establish major breakthroughs in the understanding and description of fast reactor (FR) MOX fuel behaviour under irradiation in a large variety of conditions by coupling: (i) post irradiation examinations on neutron‐irradiated fuel from past campaigns with (ii) separate effect experiments (SEE) using mainly ion implantation and (iii) multiscale modelling, from the atomic to the macroscopic scale, including thermodynamic modelling, thereby greatly enhancing the situations to be covered. Advance the predictive capabilities of fast reactor fuel performance codes by bringing them several steps forward in terms of reliability and extended simulation by (i) transferring the knowledge acquired from basic and technological research into operational tools and (ii) bringing together experts from various areas of expertise to develop and capitalize on the synergy between the various approaches (basic and technological research, modelling and experimental aspects). This will permit reduced operational margins in pile, enhance safety and reach more reliable management procedures of off‐ normal situations. Transfer the results and approach of the proposal to end‐users, develop training to prepare the next generation of researchers on fuel performance codes and fast reactor fuel and initiate or participate in original and effective outreach activities to improve public acceptance of the next generation of reactors and attract young minds to nuclear energy development.